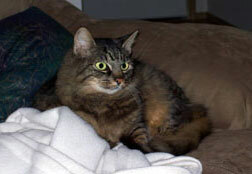 On my mother's birthday, January 18, 2007, I finally was blessed with another feline to love. The November prior, I'd tearfully said goodbye to my dear black Sable, my loving companion for more than a decade. But two months of no cat in the house was all I could bear. In God's providence I came to Feline Friends and met a big huggable blob of fur named Diesel. After two hours in my home, his name was changed to Cinnabar. The first week I had him home, I left a sandwich unattended for a few minutes and came back to find it on the floor with half the pastrami gone. I was concerned because Cinnabar is supposed to be on a strict diet because of issues with his kidneys. Other than that indiscretion, he has thrived on his prescription food. He is content to be indoors, valianty battling catnip mice and that little red dot from the pointer. His favorite place to lay is on top of me; if that is not available, he will drape his paws over my arm, rest his chin on his paws, and gaze adoringly into my eyes. He did not take Sable's place - he made his own. I couldn't be more delighted!